I’ve used my Alti Mitts for years and have found them to be of the highest quality. They have outperformed every other mitt I have owned prior to them. Although dexterity is somewhat limited in a thicker mitt, I am more than willing to trade a lack of digit wiggling for warmer hands. I live in MN where temps often fall below 0°F. From my 5 years of experience with the Alti mitt, they perform exceptionally well in temperatures down to -20°F (assuming little activity—e.g. sitting in camp. If moving and working, they perform well below -20°F). When slipping on this version of the Alti model, you’ll notice right away that the sleeve is longer than the insert. Some have wondered why the mitt doesn’t extend the full length of the gauntlet cuff. This is by design. It allows the sleeve of your jacket to fit nicely into the cuff down to the wrist. On mitts that extend the full length of the cuff, your jacket sleeve competes for the space and ends up bunching up. This leads to cold exposure and discomfort. I think that the shorter mitt relative to the shell sleeve is quite ingenious. The Alti has two adjustment straps; one on the wrist and one at the end of the gauntlet cuff. The straps are lightweight but tough as nails. They cinch quite easily. Although undoing them is just as easy, I have never had them lose their grip and slip out of place, even during strenuous activity. The mitt is held in the shell with patches of velcro. It keeps the mitt stationary. I have often switched out my Alti Mitts with a lighter gauge fleece mitt liner when the weather is not so cold. This gives me more dexterity as well. The shell is waterproof Goretex. Water addresses these mitts with deference for years. This past winter, I noticed that water finally started to permeate the shell. I examined them and found out that the impermeable coating on the palms finally wore through. The layer lasted for years with very heavy use. I’ve hacked through backcountry bush with a machete, shoveled driveways, had snowball fights, and brutalized them with all other sorts of recklessness. The exterior palm of the mitt is a very durable rubberized coated material. How it has lasted so long is beyond me. The coating provides a good amount of grip as well. Even in extreme cold, the materials retain their qualities. The Alti does a remarkable job keeping out water but allowing ample amounts of breathing. This is made possible due to the wrist. Instead of having a pre-sewn elastic binder in the wrist, the Alti has a cinch strap which allows the wearer to loosen the strap to allow more air flow into the mitt. The inner mitt wicks away moisture quite well. It is a combination of materials that includes foam and thinsulate. One tough mitt. As stated earlier, I have never been kind to these mitts. They have eluded rips and tears. I am always impressed by any mitt that will wear through before they fall apart or rip. The engineers at OR should be very proud of what they have produced with the Alti Mitt. Had mine not worn through, I would have gladly used them for another half decade or more. I believe it is with good reason that the military has contracted with OR to produce handwear for our armed forces. 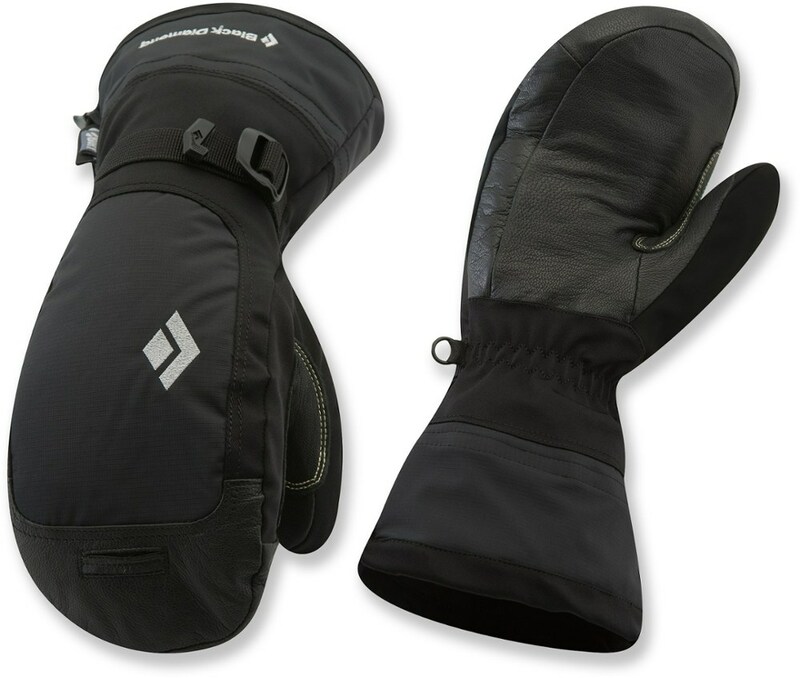 The mitt is reliable and outperforms nearly every other hand protection that I’ve tried. My OR mittens are SHELLS into which I put either Dachstein boiled wool mittens or double layer 200 weight fleece mittens. Works at -40 F.! Well insulated mitt for extreme cold, but finicky liner. This review is of an older model OR Alti Mitt, age is about 8 yrs old. For years these were my final defense against extreme cold experienced in the far north. During temperatures in excess of minus 40°C I can’t say my hands were toasty warm, but then I also did not suffer any frozen digits. 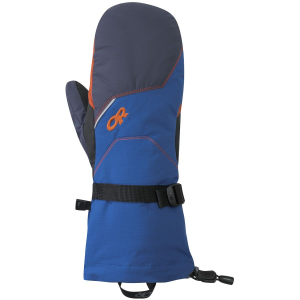 They are insulated with Primaloft insulation both in the liner and the back of the shell. The inside palm has Moonlite Pile. My initial assessment was that they were thinner than I had anticipated but proved in time to be adequate for the job. Dexterity was okay for a mitt of this type, remembering of course that the primary function of the mitt is to keep your hands warm, not to do needle point. The cut is roomy with a curved shape which aids in dexterity and prevents excess material balling up when you try to grasp something. I chose an XL in order to wear a liner glove inside. 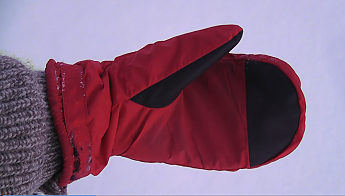 The leather palm area is much preferred to the Alti Gloves’ AlpenGrip. 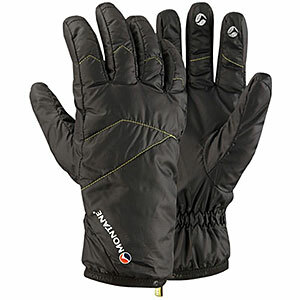 Leather, if it is properly tanned and treated, far outlasts AlpenGrip in my opinion and in extreme cold, such as these mitts were designed for, the leather stays supple and does not crack. 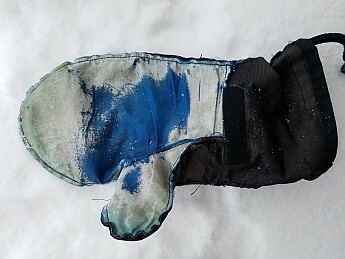 I wore these mitts as is on a 600km trip from Fort McPherson to Mayo, Yukon, during the late winter and, although I never froze, there were times I wished for a bit more insulation in them. Perhaps the main problem I have found with these is the red liner is shorter than the outer and is held in place with small pieces of Velcro. When the liner becomes the least bit wet it tends to tear free from the Velcro and ball up inside the outer mitt when I put them on. This has caused me all kinds of grief in the cold when all I want to do is get my hands warm again. I have found that by putting the liner on my hands first and then inserting it into the outer I could eliminate this problem for the most part. But, even so, it is a process to be worked out. 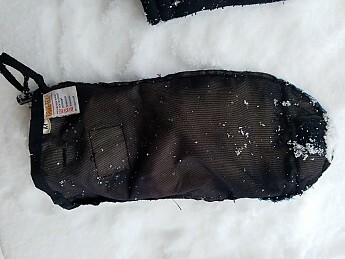 For my most recent trip I replaced the liner all together with an aftermarket VBL liner also insulated with Primaloft (shown in first picture). The one big advantage with this is the fact that it too was a gauntlet design matching perfectly the length of the Alti Mitt. With the addition of some Velcro at the opening of the mitt I eliminated the problem of the liner when wet. I also added the benefit of the VBL which adds a little more warmth and prevents the insulation from getting wet. 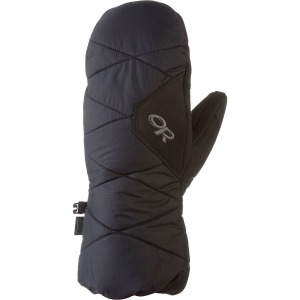 Overall, though, my experiences with the OR Alti Mitt have been positive. 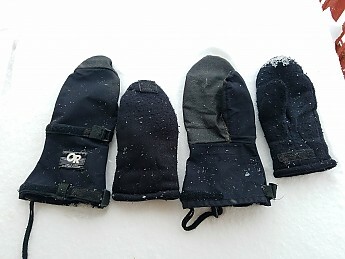 They have served me well throughout our long winters for many years. Even without the aftermarket liners, most people should find them perfectly suitable in most cold weather applications. North, when it comes to cold weather gear, I'm taking your word as absolute truth! As a Minnesotan, you are my new goto reviewer. It's rare reading about someone that has trail experience that makes MN look like the Riviera. BTW, either of my mitten liners feel nice and warm at -40 F. when I'm out for a few hours. In that temperature I need to breath through my PSOLAR mask to warm incoming air to protect my bronchial tubes. If you absolutely need the warmest mitten available, these are the gold standard as far as I am concerned. 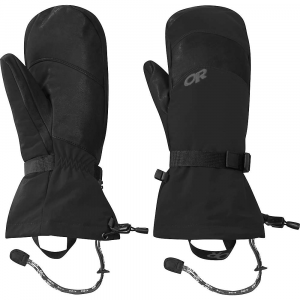 The combination of a windproof/waterproof shell with some synthetic insulation, a huge removable insulated mitt, well-designed idiot leashes, and a nicely-curved leather palm and thumb make these a winner. They are too warm for most weather and fairly bulky. My hands don't get particularly cold when i'm hiking, so i made do for years with other mittens and gloves. on really cold days, i knew those other mitts would leave my hands a little cold. a few years ago, i found these on sale and took the plunge. i should have bought them years ago. 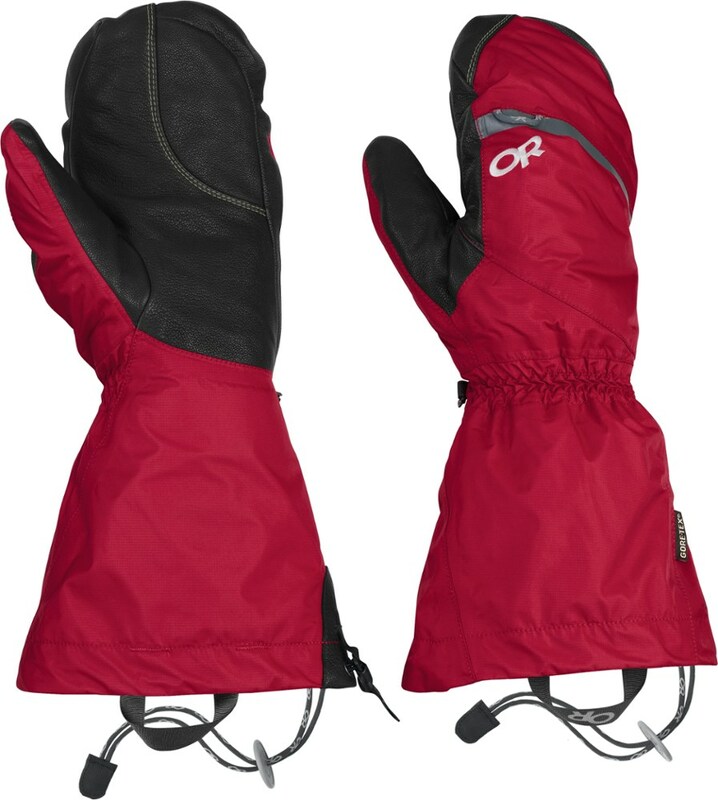 I have used these on several hikes in and around the White Mountains of New Hampshire in the winter. First, they are without question the warmest winter hand wear i have used. worn with a pair of relatively thick glove liners, they have kept my hands happy in the worst weather. -30, -35...they are fine. i like the fact that the outer shell (windproof/waterproof gore tex on the back, nice grippy leather palm) includes some additional insulation on the back, primaloft, in addition to the mitten liner. second, they give you a surprisingly good feel for whatever is in your hand for a mitten designed for deep cold. the liner has fleece between your fingers and the palm of your hand because it gives you a little better feel for an ice axe or trekking poles. i also like that the palm and thumb have a good curve, makes them easier to wear and grab things. having a removable liner makes them very easy to dry out. i have had days where the liners were a little damp from sweat; i just remove them and sleep with them in my bag, and they dry overnight. 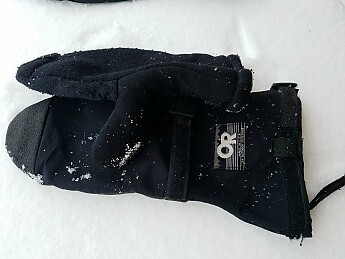 third, the leashes, necessary in bad weather, are both easy to use with mittens via a large disk that tightens them and highly visible because they have light-reflective strands woven into the leash. fourth, the pull cord that seals the gauntlet is easy to use with mittens on, with one hand. fifth, the gore tex shells work - well-taped, they don't leak. i chopped ice away from a spring that runs year-round in the white mountains, ended up with quite a bit of water all over the mitten shells in sub-zero weather. the mitts were sheathed in ice; my hands were dry and happy. sixth, they are made very well. 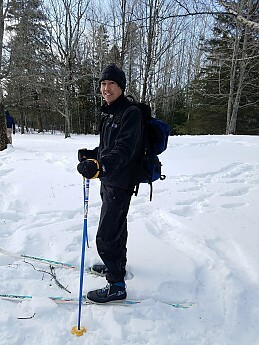 no failures, no loose stitching, nothing has torn or ripped, despite fairly significant contact with brush, rocks, and ice, and having spent quite a bit of time gripping the head and shaft of an ice axe. Apparently, the shells have a pocket somewhere to hold small hand heat packs; i have never used those. The only downsides, for me, are that these are very bulky and too warm for temperatures much above zero, unless you have circulatory problems. while the shell can be worn alone with lighter gloves, the shells are fairly large to accommodate the big mitten insert and a little baggy to wear with thinner gloves alone. also, they cost an awful lot unless you find them on sale. 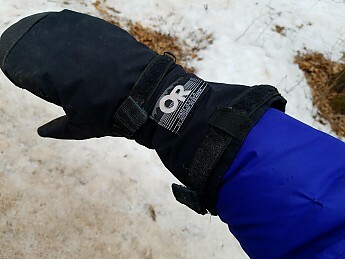 If you hike or ski in sub-zero weather and want to keep your fingers intact, and if you want something that will last a long time, these are well worth it. OR makes really top quality clothing. My OR GTX shells needed seam sealing but I bought them in the '90s. I got size XL to fit over my Dachstein boiled wool mittens or my EMS double layer fleece liners. Either one works very well at -40 F. in my experience. The best cold weather protection for your hands. Over the years I have bought many pairs of branded ski gloves and none of them are in the same class as these. At first they did take a bit of getting use to, if you are use to wearing fingered gloves because there is a bit more room in mitts, but once you settle in to them the warmth takes over and you realize just how good they are. If you buy your correct size there is enough room inside to wear a liner glove, not that you need to, but wearing a liner is very useful if you need to use your fingers in very low temps IE taking pictures etc. Not only that but wearing a liner helps to keep the main mitt and liner clean inside. The craftsmanship is first class and the stitching is spot on. This is how things should be made. They are not cheap which puts them at the start of the custom made price range. The build quality speaks for itself. 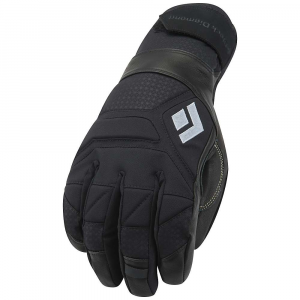 With Kevlar stitching and leather palms and Gore-Tex these mitts are bulletproof. The factory rates them from -20°c down to -40°c so I tested them out and those figure are mighty close at -40°c/-40°f and I would say if someone with good circulation wore them then they would be comfortable in temps a lot lower. So the factory rating is a bit understated for safety reasons. Sounds like a nice setup, 1lonewolf. I hope you'll keep us posted on how your mitts continue to work out for you. I liked hearing about the updates to the alti. I have an older pair that I've used for years and they're great but only good down to about -20*F. The new -40* rating is impressive. Hi GT, the tests I saw they performed very well down to-37*c/-34.6*f, I think if a person added a thin liner with a thin wool liner on top and then the inner and outer Mitt it would take these Mitts way past their factory rating, So far I have not needed to use any extra liners, As with all Mitts/Gloves keeping your hands warm before wearing them is a big help because all gloves will have a tough time warming cold hands so keeping your hands warm before hand makes these Mitts jump in to action and just get warmer and warmer matching your bodies temp, They are nice to wear above freezing but they are over kill and in such temps they do get very warm. I just received this product and I had to review it! I specialize in cold weather hiking/camping, I train at Mount Washington, N.H., and am going to Nepal in 2016. I need a glove that will give me extremely good warmth and these gloves deliver. Unbelievably well made and the Polortec leaved my hands sweating right when I put them on. Hi Craft. I hope you'll update us on how the Alti Mitts perform for you on Mt. Washington this winter and in Nepal. Very frank and objective review. 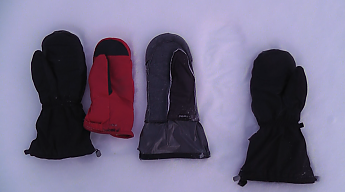 I Own OR GTX shells to wear over my EMS double layer fleece mittens or Dachstein boiled wool mittens. The Dachstein mittens inside the shells were very warm at -40F. I thinhk my layering method is better than the liners that OR provided with the mittens you reviewed. PLUS I am decidely NOT a fan of any iteration of Primaloft. Climashield would have been a better synthetic insulation choice for OR to have made. I only had these in around zero degree F temps but they were incredible. When I topped the mountain I was hit with a very cold arctic wind and the fleece gloves I was wearing did nothing. By the time I could drop my pack and get these mitts my hands were numb. I did not have the dexterity to use my hands to put the mitts on and had to use my teeth. Once I had these mitts on, my hands were able to recover quickly and stay toasty warm. I don't think the zero degree F temps I experienced was really a challenge for the mitts. These mitts are very well made and I would not hesitate to buy them again.